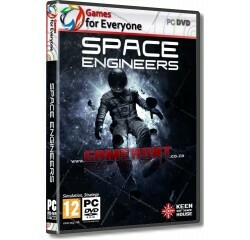 Space Engineers - R140,00 : Game Hunt, Where we lead, others follow. Space Engineers concentrates on construction and exploration aspects, but can be played as a survival shooter as well. We expect players will avoid engaging in direct man-to-man combat and instead use their creativity and engineering skills to build war machines and fortifications to survive in space and on planets. Space Engineers shouldn't be about troops; it should be about the machinery you build. Single-player - you are the sole space engineer. Customizable character - skins, colors, community market, male and female character. Ships (small and large) - build and pilot them. Super-large worlds - the size of the world to 1,000,000,000 km in diameter (almost infinite). Procedural asteroids - an infinite number of asteroids to the game world. Manual building in survival mode - use welder to assemble blocks from components; use grinder to disassemble and reuse components. Deformable and destructible objects - real proportions, mass, storage capacity, integrity. Building blocks - over 200 blocks (gravity generators, jump drive, turrets, doors, landing gears, assembler, refinery, rotors, wheels, thrusters, pistons, wind turbine and many more). Programmable block - allows players to write small programs that will be executed in the game. Electricity - all blocks in a grid are wired in an electrical and computer network; electricity is generated by nuclear reactors or various power sources. Gravity - produced by planets and gravity generators. Spherical gravity generator also available. Symmetry/Mirroring - useful in creative mode when building structures that require symmetry. Weapons - automatic rifle, small and large explosive warheads, small ship gatling gun, small ship missile launcher. Processor - Intel i5 @ 3.0 GHz or higher (or AMD equivalent)® or equivalent AMD® processor.